Azerbaijan is a reliable partner of the US in the fight against international terrorism, US ambassador to Azerbaijan Earle Litzenberger said. 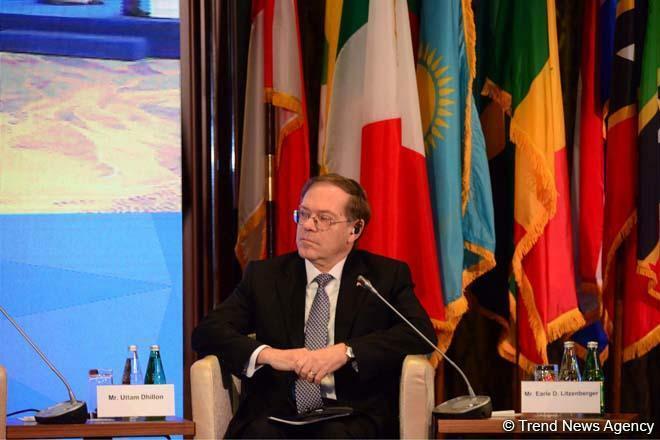 Litzenberger made the remarks at the 36th International Drug Enforcement Conference being held in Baku, Trend reports on April 15. The ambassador said that by sending peacekeeping forces to Afghanistan, Azerbaijan makes an important contribution to ensuring international peace. By conducting such activities, the country makes a significant contribution to the fight against illicit drug trafficking, Litzenberger added. He also stressed that Azerbaijan is located in an important geostrategic area. The 36th International Drug Enforcement Conference, organized by the Azerbaijani State Commission on Combating Drug Abuse and Illicit Drug Trafficking together with the Drug Enforcement Administration of the US Department of Justice kicked off in Baku on April 15. The conference, organized with the active participation of the Azerbaijani State Customs Committee and dedicated to the topic "Mobilization of global partners", aims at bringing together high-ranking officials involved in the global fight against illicit drug trafficking, discussing the ways to solve this problem, exchanging views and best practices. The international conference, which brought together about 500 representatives from over 150 countries, will create conditions for the use of modern methods of combating illicit drug trafficking. The proposal about holding the international conference in Azerbaijan was obtained from the Drug Enforcement Administration of the US Department of Justice. The Organizing Committee for holding the 36th International Drug Enforcement Conference in Baku was created upon Azerbaijani President Ilham Aliyev’s decree dated November 15, 2018.